Data Center Networking Market size is set to exceed USD 35 billion by 2024; according to a new research report by Global Market Insights, Inc. 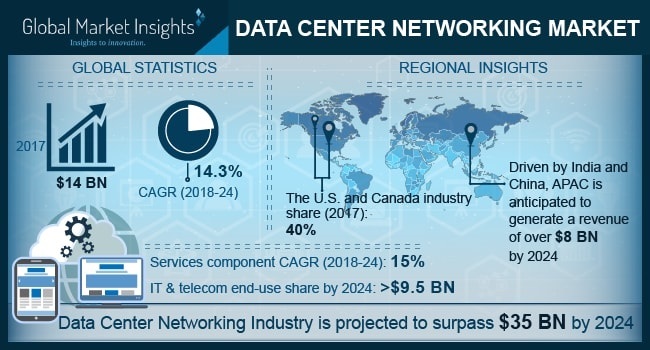 The high growth of the data center networking market is strongly aided by the increasing focus of data centers to improve the bandwidth speed and connectivity. Data centers located in faraway location and in colocation settings store large databases of information that are required immediately. In such a scenario, lags in the relay of data can be detrimental to business operations, fueling the demand for advanced networking technologies such as 100 Gbps and 400 Gbps Ethernet switches and silicon photonics. The data center networking market is gaining traction owing to the rising adoption of cloud deployments. IoT and cloud computing provide significant cost savings to businesses in terms of reduced capital expenditure and maintenance charges. This has led to the need for replacing traditional networking solutions with hardware that have cloud computing capabilities, fueling the industry growth. In June 2017, Telefonica announced the beginning of the construction of a 2.6 MW data center with cloud capabilities in Peru. The increase in such activities is anticipated to drive data center networking market demand in the coming years. The segmentation of the data center networking market indicates that the services segment is anticipated to witness a significant growth to reach over USD 8 billion by 2024. Organizations are increasingly outsourcing management activities such as consulting, repairing, and maintenance to licensed external players. The increase in the construction and modernization of facilities is contributing to the increase of professional services such as installation and integration. Additionally, various organizations do not understand their network requirements such as the scalability of their infrastructure and, in most cases, undermine or overestimate their network and storage requirements, making consulting in the data center networking market a prime requisite. The trends in the data center networking market indicates that IT & Telecom and BFSI sectors are prime adopters of the technology with BFSI sector valued at over USD 2.5 billion in 2017. These enterprises are required to store and access large amounts of data, which need to be accessed in real time. Additionally, financial services firms need reliable and fast connectivity to support latency applications for tasks such as online trading and payment processing. Countries including China and India have become hubs of outsourced services owing to the low costs of resources such as labor, technology, and space. India data center networking market was over USD 450 million in 2017. In the aftermath of the Digital India campaign and the Start-up India Stand Up India initiative, there is a rise in the number of IT industries, which has amplified the demand for these technologies within the country. The declining costs of semiconductor components are anticipated to drive the growth of the data center networking market. Th advent of technologies, primarily in countries including India and the Philippines is done at relatively lower costs as compared to their Western counterparts, contributing to a strong growth potential of the industry. Additionally, the trend of outsourcing to emerging Asian countries is further driving the industry. The players operating in the data center networking market comprise Brocade Communications, Arista Networks, Cisco Systems, Inc., Delta Electronics, Inc., Dell, Inc., Hewlett-Packard Enterprise, IBM Corporation, and Juniper Networks. As the industry comprises many players, companies are required to undertake strategies like partnerships, mergers and acquisitions, and invest heavily in R&D to sustain continuous growth. For instance, in February 2015, Hewlett-Packard Enterprise announced the launch of a new line of open network switches for web-scale cloud data centers. The product launch is anticipated to further improve its hold in the provision of cloud capable solutions in the industry.